Former San Diego Mayor Pleads Guilty To Criminal Charges : The Two-Way Bob Filner was charged in connection to sexually harassing three unidentified women. The disgraced former mayor pleaded guilty to false imprisonment and two battery charges. Mayor Bob Filner of San Diego speaks at a news conference in July. 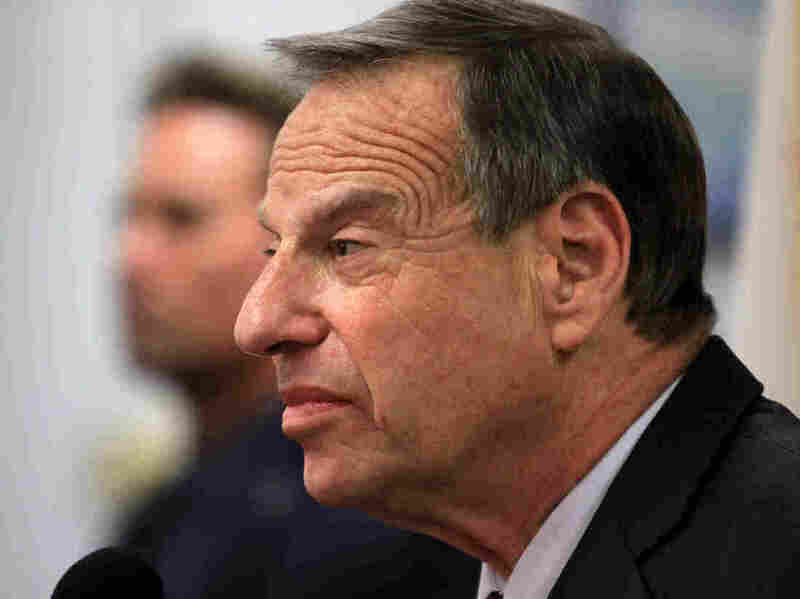 Former San Diego Mayor Bob Filner pleaded guilty to three criminal charges on Tuesday that stem from allegations of sexual harassment by three unnamed women. The Democratic mayor and nine-term congressman, if you remember, was forced to resign from his office after allegations of harassment mounted over the summer. Filner left office, declaring his innocence, saying his resignation was a "political coup," orchestrated by a "lynch mob." "I have never sexually harassed anyone," he said at the time. The San Diego Union Tribune reports that Filner pleaded guilty today to "one criminal count of false imprisonment by violence, fraud, menace and deceit and two misdemeanor counts of battery." "Mr. Filner was the first Democratic elected mayor in San Diego in more than 20 years. As part of his stepping down, the city agreed to pay most of his legal fees and punitive damages in any sexual harassment lawsuit. The agreement did not shield him from the criminal prosecution announced on Tuesday. "The state attorney general's office took over the prosecution of the case at the request of the San Diego district attorney, Bonnie Dumanis, a Republican, who lost to Mr. Filner in the mayoral race."